Why do Muslims kill for Islam? Our book decodes the Koran and answers this question. Use this book to prove to your family, your friends and your colleagues that believing Islam will be reformed is like believing in unicorns. This website exists to discuss the most fundamental Islamic texts, to prove to ordinary people that the problems the world faces with Islamic terrorism and intolerance are rooted in the Koran, the Hadiths and the history of Islam. 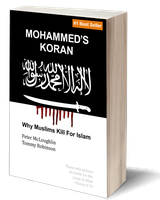 By putting all these texts online and making them all searchable and all available to be cross-referenced in open discussion, this site shows that we have absolutely no expectation that anyone can disprove the claims made in our book Mohammed's Koran. What is truly incredible is that the evidence about Islam in Mohammed's Koran was accepted wisdom among academics, politicians and clergy in the West throughout the 20th century. Following 9/11, with the demonstration that the West had a 5th Column (people who were truly dangerous to our civilisation) the Quisling elite took it upon themselves to mount a wall of deceit in order to stop all critical scrutiny of Islam and to continue their project of Islamisation. Facing up to the inherent violence of Islam is the biggest issue of the 21st century. Forget the unproven claims about global warming, etc. All your worst fears about Islam are provable not just in the "holy" texts but in the history of how Muslims have implemented the commands and examples contained in those texts. The West's greatest historians of Islam have already predicted that Europe will be Islamic by the time current school-children have reached retirement. Yet this demographic tsunami is a subject that neither government nor media will even discuss. If you would like to know more about this book, here is a summary of Mohammed's Koran. You can spend hours, days, weeks exploring the texts on this site, and you will come to the conclusions we demonstrate in our book. Or you can simply buy the book and acquire that knowledge in minutes not months.